Sophie regularly provides workshops where she teaches her artwork technique. She has taught in Australia, New Zealand, South Africa and the United States. Contact Sophie to inquire about commissioning artwork, ordering prints or to attend her workshops. Working from the Seychelles, Sophie Standing is a British born artist who has lived in Africa for 15 years. She produces her art by combining applique and free motion embroidery. 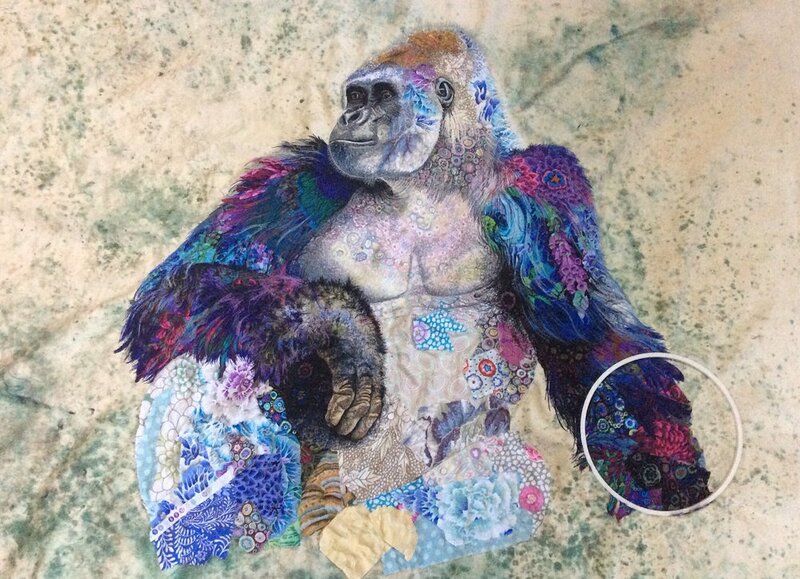 The details of the animals are created by sewing with different coloured threads only. For the applique, Sophie mostly uses cotton fabrics from Liberty Tana Lawn and the Kaffe Fassett Collective (Philip Jacobs, Kaffe Fassett and Brandon Mably). Her sewing threads are 100% cotton and made by Aurifil of Italy. Sophie produces work up to 1.5 meters long, and a single piece of art this size can contain 3000 meters of thread. Sophie works on a private commission basis, creating bespoke pieces of art for clients all over the world. The process starts with Sophie and the client looking at photographs of the animal. She then produces graphite drawings, which are transferred into the final artwork. Sophie discusses the fabric colour palette with the client before sewing away.